July 1927 – A new working men’s club was opened by Councillor Fred Holroyd. The new building, which replaced less commodious premises on Huddersfield Road, is situated on a site in Rosebery Street, and has been designed by Mr Exley Fisher, who is architect to Elland District Council. The cost of the building, exclusive of fence wall and furnishings, will be around £3,000. The building is faced with best Huncoat bricks and the dressings are of stone. The roof is covered with Welsh slates. The basement contains a large beer cellar, a spirit store, and a heating apparatus chamber. On the ground floor there are the billiards room, committee room, conversation room, ladies’ room and kitchen, together with the bar and the usual conveniences. It is intended to construct bowling greens and tennis courts. Councillor Holroyd was handed a presentation key, made of solid silver gilt, and he then opened the club. Entertainment was provided by Elland Silver Band, handbell ringers, a Pierrot performance and sports for the children (a prize for all participants). Best wishes to Elland WMC on their 90th anniversary at Rosebery Street. A short note about Councillor Holroyd. The Elland WMC opening ceremony was the first occasion that Fred Holroyd had been seen in public since he had been awarded the ‘Order of the Nile’ by King Fuad of Egypt. 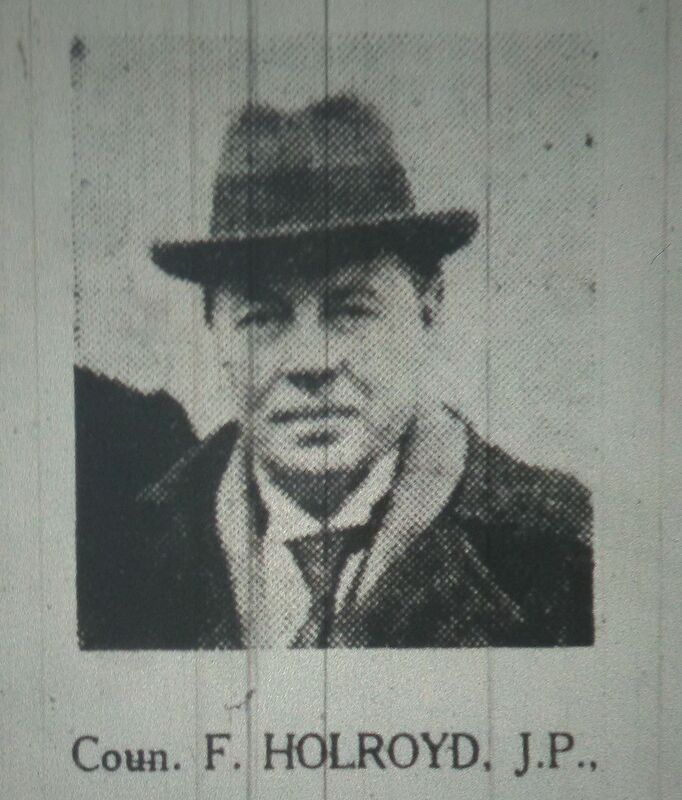 Councillor Holroyd was the president of the International Cotton Spinners’ Federation and had visited Egypt to build upon trading links, especially the purchase of Egyptian cotton. King Fuad had been invited to visit Britain during this visit; an invitation that he gladly accepted. Sadly the King did not visit Elland during his tour of Yorkshire. Also from 1927 – Rumours were sweeping through Elland that a Mr Storey of Brooklyn Terrace, Savile Road, had won a large amount of money in a sweepstake. It was said that Mr Storey had told his fellow workmen that he was hopeful that his winnings would run into four figures and it was also stated that he had a share in a £16,000 winning pot. (Over £1 million today). Naturally the local press caught wind of this gossip and dispatched a reporter to chez Storey. The bemused lodger answered the door. He confirmed that Mr Storey had indeed drawn the winning horse in a sweepstake but the amount would be far less than four figures. The reporter left most disappointed! History Room at Elland Library open every Tuesday & Thursday 2-4pm. Launched in 2005, Go Local publishes independent magazines containing directories of local services and businesses. The magazines also features news and events in and around the local areas we cover and have become a focal point for business owners and residents of the surrounding villages. Published 10 times a year and covering Ripponden, Barkisland, Soyland, Mill Bank, Rishworth, Norland, Sowerby and Sowerby Bridge. Published 10 times a year and covering Elland, Greetland, Stainland, Sowood, Holywell Green, Jagger Green and the Calderdale area of Outlane. Keep up to date with Go Local. Follow, tag and share news and events on Facebook and Twitter (and remember to hashtag #yourgolocal).